Lets have a look at a new video song Kabhi Jo Baadal Barse from the upcoming comic thriller Jackpot. The movie stars Nasseruddin Shah, Sunny Leone and Sachin Joshi in lead roles. Kabhi Jo Baadal Barse is a romantic number featuring Sachin Joshi and Sunny Leone romancing each other passionately. 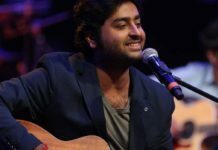 This beautiful song is composed by Sharib-Toshi and sung by the new king of romantic songs Arijit Singh. Female version of the song is sung by none other than Shreya Ghoshal. The presence of Sunny Leone makes this video a delight to watch and moreover there are some mind-blowing locations captured which will make you fall in love with the song. What are your view on this romantic number. Do share with us.